New Delhi/Mumbai, Feb 20 Operations of cash-strapped Kingfisher Airlines continued to be disrupted for the third consecutive day Monday even as the government reiterated that it will not bailout the Vijay Mallya-led carrier. 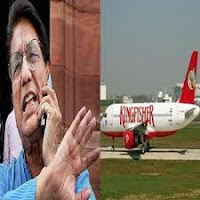 "Government is not going to give any bailout or ask the banks to bailout any private airline or any private industry for that matter," Civil aviation minister Ajit Singh told reporters here. According to Singh, the the Directorate General of Civil Aviation (DGCA) is looking into the matter and is awaiting a reply from the airline. "DGCA is inquiring into the matter. Our first concern is about the ongoing flights and that passenger safety should not be compromised. Let us see what reply they (Kingfisher Airlines) give," Singh said. Singh blamed the crisis on the airline management for not paying its employees as a reason behind Saturday's strike in Kolkata. "They did not give salary to their employees for many months, people went on strike in Kolkata. Naturally, the flights got cancelled," Singh said. On Sunday the regulator ordered an inquiry into the large-scale cancellations. "We have called for the cancellation data from all over the country. They did not inform us of any cancellation plans," DGCA director general E.K. Bharat Bhusan told IANS. "This is unprecedented act which has led us to take this step (investigation)," Bhusan added. According to a DGCA official, the airline has violated rule 140 section A of the Aircraft Rules, 1937 by not seeking the prior approval of the regulator before curtailing its schedule and has already violated civil aviation requirements (CAR) regulations which ensures compensation to the passengers in case of denied boarding, cancellations and delays. The carrier's is only operating 16 of its fleet of 64 planes. The cancellations have affected incoming or outbound flights in major metros like New Delhi, Mumbai, Chennai, Bangalore and Kolkata. The abrupt flight cancellations has created major problems for passengers waiting to travel after having booked their tickets months in advance, officials at the national capital's Indira Gnadhi International (IGI) airport and Mumbai's Chhatrapati Shivaji International Airport told IANS. A KFA spokesperson blamed the flight disruptions on certain unexpected incidents like 'bird hits' which rendered its aircraft unserviceable. The flight disruptions are expected to continue for another three to four days with only 208 flights in operations, but the carrier has not shut down nor does it plan to close down any stations, the official said. "The speculation that we are reducing our operating schedule from 240 flights a day are ill-founded, as we will operate the full schedule on our booking system within the next four days," the spokesperson added. While admitting that its bank accounts have been attached by the Income Tax Department, KFA said in the past also similar issues have happened and they have been resolved. The developments come after high fuel costs and falling revenue resulted in KFA losses in the third quarter of the current fiscal mounting to Rs.444 crore from a net loss of Rs.254 crore suffered in the like quarter of 2010-11.